This last weekend, my beloved and I journeyed to Santa Barbara to celebrate our 4th anniversary. Because he’s the most extraordinary man in the world, he indulged me when I asked if we could take a painting class at The Painted Cabernet, where you drink wine as you copy a pre-selected, super girly painting under the instruction of a real artist. As soon as I saw the TARDIS blue of this last Saturday’s picture to copy, I had to go dip a brush in that luscious paint. I didn’t paint this. It’s the original painting we were to copy. I’d never painted before. I spent a year in a Disney workshop with Bob Kato learning how to draw mostly by osmosis from the Imagineers and other artists, although Bob took pity on me from time to time and taught me stuff, but that involved mostly pencils and some charcoal scribbling. My sketches survived only because I managed not to bawl on them over my comparatively incompetent doodling. When we arrived in the painting class, I felt weirdly confident that whatever strayed from my brush tips wouldn’t make me cry. Maybe it was because Mickey’s yellow shoe wasn’t crushing my self confidence. Or maybe it was the dearth of Imagineers. I’m not sure. My Evil Plan propelled me fearlessly toward the canvas. Our instructor Amelia gave us smocks. I got her favorite smock, upon which a friend of hers had painted a heart on the chest one day to heal her broken one during a rough breakup. I now had two hearts. Oh, yes. I listened carefully as Amelia gave us the download on brushes, paint and…other stuff I can’t remember because I stopped paying attention as soon as she pumped a wad of that heavenly blue on her palette. I was hypnotized by that color. It evoked visions of Nine in his leathers, Ten in his tennies, and Eleven in his bowtie. Bowties are cool. Blue is cool. As soon as I started making noises that I was enjoying myself far too much–and not just because I was drinking champagne–Amelia came over and cast a somewhat puzzled look at my swishes and swashes, but continued to make encouraging noises. (She was actually a very good teacher.) As soon as she left, Bret leaned over for a look. By the end of the two-hour class, I was thrilled. 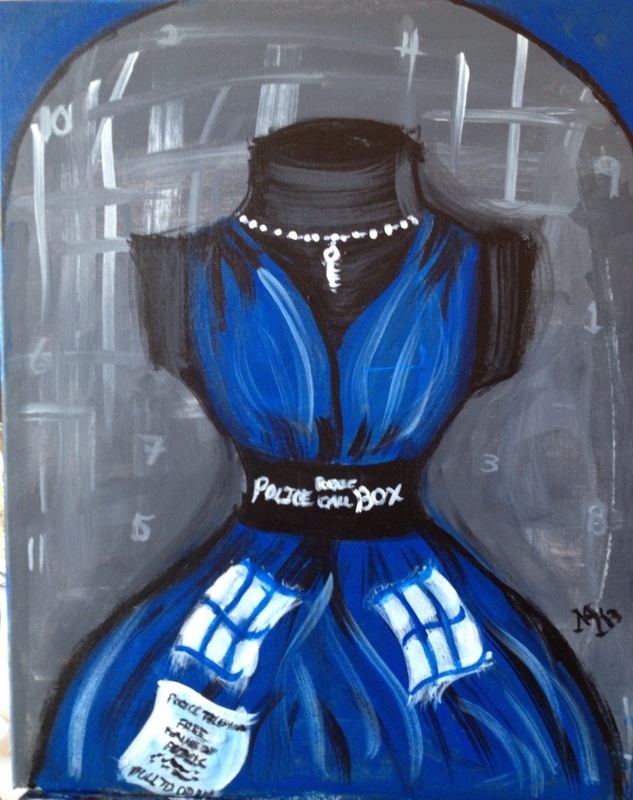 Behold: a 1950’s TARDIS dress! 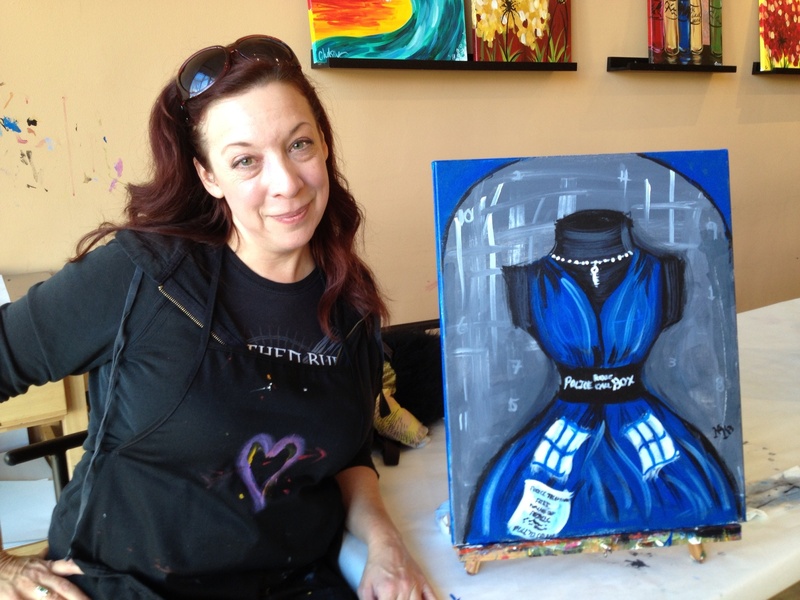 I added numerals 1 to 11 in the background and gave her a necklace with the key to the TARDIS. Something broke in my head when she asked that question, dampening my excitement a bit as I realized I was really in another world. We then explained that, in fact, lots of people in science fiction fandom would get it and shared with her the goodness of The Doctor. ♥ What a pretty concept!